Can’t recommend this 4 Part Series on the Financial Crisis and the aftermath enough. It’s amazing, chilling and sickening. In 2009 when the Republicans looked like they were about to vanish from the political scene in the United States I was debating online with one of my regular Republican sparring partners and I said something about how the Republicans didn’t stand a chance in the next elections. He turned out to be right, and 2010 followed 2008. 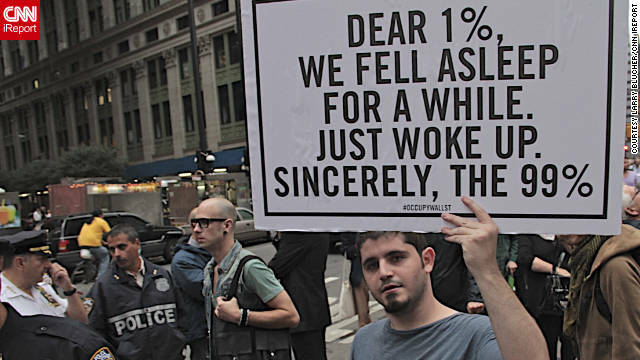 It’s hard to tell what the ultimate effect of the Occupy Wall Street movement will be on American politics, but it’s clear that the protestors are tapping into something significant and that this could have huge implications for our politics. A month into the movement, protests broke out yesterday in 951 cities across 82 countries. Most of the criticisms of the movement center on a lack of clarity on their agenda, but a few things seem clear: they’re protesting a system where entrenched special interests call the shots and everyone else pays the price. No matter what side of the political fence you’re on, it should be clear that the U.S. political system has still not dealt with the problems that led to the Great Recession and the underlying economic and political institutions that enabled those problems. Three years after the economic collapse, we have a real unemployment rate that is close to 15%, a huge deficit problem, the highest spending in years, the lowest taxes in a few generations and a Congress that would rather spend their time casting symbolic votes for a Balanced Budget Amendment than actually coming up with a plan that asks for sacrifice on the part of anyone except the most vulnerable in our society. Their solution to deal with the unprecedented deficits is to give even more tax breaks to the wealthy and dismantle the already frayed American social safety net that so many people fought so hard to create. The ultimate result of the Tea Party elections in 2010 is that the Congress has been taken over by a small minority of zealots who have done nothing to deal with the problem that most Americans are concerned about: the persistently high unemployment rate. Since the March 2009 lows, the stock market has been on a tear as corporate profits have steadily increased, but the unemployment rate has stayed stubbornly high and now close to 1/3 of Americans are underwater on their mortgages. Meanwhile, the banks that hold these mortgages get money at zero interest from the government which they then turn around and gamble in rigged capital markets that almost guarantee profits. Moderate legislation to control those banks is opposed by that same small band of ideological zealots who protect these powerful interests and their cowardly Democratic friends who live in fear of being called Socialists for breaking up a cartel that lets four institutions control almost 40% and ten institutions control 60% of the assets in this country. Three years after the Republicans were defeated soundly in the 2008 elections, the Bush tax cuts still remain in effect even though the numbers of people who would rather see tax increases on the top 2% before they see cuts in government spending ranges from two-thirds to three quarters of American’s. Once again, even attempts to increase those taxes to the levels they were during the greatest economic boom in twenty years is decried as Socialism. Meanwhile, the trends on income disparity are even more dramatic. From 1952 to 1982, the percentage of wealth made by the top 10% remained fairly steady at around 35%. Beginning in 1982 the percentage of income made by the top 10% began to increase dramatically. By 2007, at the height of the Bush economy, the top 10% earned more than 50% of the wages in America. During the same years, middle class incomes remained stagnant and poverty actually increased. Republicans continue to say that the country is “broke,” but they oppose any attempts to cut back on our military presence around the world while our internal infrastructure continues to crumble and (does anyone see a pattern emerging?) any attempts to make investments in America are decried as Socialism. Anyone but the Fox addled (and that is apparently a significant segment of America) can see that the Tea Party missed the mark: that the problems of this country don’t end with cutting taxes and starving government; that it’s a galling contradiction to vehemently oppose the bailout and then completely punt when given a chance to support regulations that would prevent the need for the next bailout; that the real problem is a system that is so controlled by special interests that it makes real change almost impossible, no matter who is in control of Congress. Many of these problems are intractable and systemic, but others can be remedied with some common sense measures. Occupy Wall Street and their supporters should push for a constitutional amendment rolling back the Citizens United case. I’ll leave the drafting to the lawyers, but an amendment should give the government the power to regulate campaign contributions, should stipulate that corporations are not entitled to the same rights as citizens and that giving money to political contributors shall not be considered speech. Constitutional Amendments are extraordinarily difficult to pass, but the prolonged effort needed will help to create a movement and politicians who believe that giving money is the same thing as speech and “corporations are people,” will have to answer for that. Unfortunately, it may be a long time before conditions are right for Congress to revisit financial reform, but that shouldn’t stop Occupy Wall Street and their allies from pushing for it. Banks should not be able to run what are effectively hedge funds out of the back door of their banks. Make a choice: you are either a hedge fund or a bank. Not both. Regarding income inequality, when the top 1% control 35% of the wealth in a country and the top 20% control over 85% of the wealth in a country, that is a real problem and it needs to be dealt with. Not only should the rich be paying higher taxes in this country, but the upper middle class should be as well. As I said initially, it’s far to early to predict the effect of Occupy Wall Street on American politics. The demonstrator’s demands may not fit within the range of possibilities of our sclerotic political system, un which case they will become an interesting footnote in American history. Still, this movement has potential and I’m cheered by the fact that the Left is finally waking up in this country and that there may finally be a counterweight to the corrosive efforts of the Tea Party. The 99% are waking up. Here’s Steve Kornacki on why those abysmal June jobs numbers could be a huge problem for Obama. Could be an interesting 2012. Just catching up from the holidays and posting a few things I missed while gone. This is from the aftermath of the tax deal. He cited some of the same reasons that I had given for arguing that it wasn’t such a bad deal for Obama, namely that Obama, in effect, tricked the Republicans into running short term deficits to stimulate the economy after they spent two years arguing that deficits were no good and very bad, even during a recession. For someone who spends their time writing and thinking about politics, that is a stunning statement to make. We’re in the greatest recession since the Great Depression, hiring has stagnated and we are debating a policy that you believe will add 1% to the GDP and lower unemployment by 1.5%… But you consider that a bad thing because Obama might get re-elected when more people have jobs? That’s positively Limbaugh-esque. But I digress…Krauthammer followed this one up with another article in which he said that, if Obama is reelected, “historians will mark his comeback as beginning on Dec. 6, the day of the Great Tax Cut Deal of 2010.” There’s a lot of water that needs to pass under that bridge, but this may ultimately be true. If the economy comes back, Obama’s going to get the lionshare of the credit. The stimulus effectively built a floor under the economy and (we can hope) the new package will prime the pump for more private sector hiring to get this economy going. All in all, Obama ends his 2nd year with a ton of challenges, but also a ton of accomplishments. And even though the Democrats had historic losses in the House, his approval is still better than Reagan and Clinton at the same time in their presidencies. and now comes the pivot to the center. All this against the backdrop of a Republican Congress that ended the year explaining how some $17 billion in unemployment extensions during the worst recession since 1932 “need to be paid for” but $140 billion in tax cuts for the top 2% can just be added to the deficit. Republicans began righteously protesting $8.3 billion of earmarks in Harry Reid’s omnibus spending bill. They seem not to understand how ridiculous this looks after having agreed to a Stimulus II that even by their own generous reckoning has 38 times as much spending as all these earmarks combined. As I noted before, the biggest short term benefit to this deal for Obama is to show how hypocritical the Republicans are when it comes to running deficits that benefit their core constituency (those in the upper income brackets). At least on that point, I’m with Krauthammer. I have to say that I have been surprised at the liberal fulmination over the two year extension of Bush tax cuts. On one level, I get it: it’s frustrating as hell that the Republicans acted as irresponsibly as they did over the past two years and have been rewarded with a control of the House, 6 new seats in the Senate and the policy that they care about the most: tax cuts for the rich (which are also the least economically stimulative of the policies that have recently been considered). Still, it’s hard to say that you couldn’t see this coming and I would argue that the total package is not a bad deal either politically for Obama or economically for the country. Regarding the extension of tax cuts for the rich, the die was probably cast when the Democrats punted on taxes in the run up to the election. They didn’t have the votes in the Senate for an extension of tax cuts for just the middle class (due to Republican filibuster threats and Democrats that vote like Republicans) and didn’t want to put a handful of their own members in a situation of filibustering the Democrats’ tax bill just before a tough election. The House, in turn, refused to take another tough vote if the Senate couldn’t pass the bill. The Democrats problem here was the same one that they had for the past two years: they were afraid to stand up to the Republicans and provoke a fight over taxes. What they should have done is made the Republicans (and Lieberman, Ben Nelson, Blanch Lincoln, etc.) filibuster….and I don’t mean have a cloture vote, say that they couldn’t get 60 votes and then go home early for the weekend. I mean make them stand up on the Senate floor and talk and talk and talk about why they were filibustering tax cuts for 98% of the people so that they could preserve taxes for the top 2%. They may not have gotten their bill passed, but it would have been a clear contrast for the American people and they could have prepared the public for the fight we are having now and put pressure on Republicans for a better deal. Senate Democrats have complained that Obama is not standing up enough to the Republicans, but they are the ones responsible for not dealing with this issue until the last two weeks of this session and giving the Republicans maximum leverage. And while the deal cut with Republicans is far from an optimal deal, there are a number of ways that this deal works politically as well as economically for the President and the country as a whole. First, most economists agree that the economy needs additional stimulus and that the worst thing you can do during a deep recession is to cut government spending and raise taxes. Obama clearly believes this as well, since he has argued for it both domestically and internationally again and again, even when he can’t get agreement from allies. Just after the election, I commented on Peter Beinart’s lamenting ”the Death of Keynesianism” as a result of the Republican victory. In the aftermath of the election it seemed that the dysfunction in Washington left Ben Bernake’s Fed holding the only weapon in the fight to revive our economy. But the president is showing that the death of Keynesianism has been greatly exaggerated, at least for the short term. While the policies agreed to in the compromise are far from the most effective stimulative policies, they will provide some lift to the economy that would have been missing had the Republicans governed like they campaigned. As I’ve said before, I’m not completely opposed to a 2 year extension of the Bush tax cuts for the top 2%, although I would rather see those provisions expire and the money be redirected to tax cuts that actually stimulate more (like a payroll tax cut that benefits employers as well as employees (instead of just employees)). It also would have been nice to get some construction projects to deal with our crumbling national infrastructure, but perhaps this was a bridge too far for the Republicans. What we will get is a package of tax cuts that, depending on how you break them out, amount to close to a stimulus of $900 billion (or $600 billion over and above what had previously been supported by both parties). In addition to the economic benefits of the tax cut deal, Obama may reap some political rewards as well. As Chuck Todd has pointed out, part of Obama’s problem over the past two years has been that he has acted more like a Prime Minister trying to shepherd his agenda through Congress than a President using the bully pulpit to call legislators out in order to build support for his agenda (as he was able to do so effectively in the 2008 campaign). And while the strong reaction from the left has been surprising, recent opinion polls have showed broad support for the deal. In addition, economists have projected that the tax cuts will increase the GDP by as much as 1%, create an additional 3 million jobs and decrease the unemployment rate by close to 1.5%. As an added bonus, the debate has shown just how hypocritical the Republican party’s leaders really are. For the past two years, they consistently complained about the budget deficits that were run in order to prevent an even larger economic collapse than we actually had. They pretended that they couldn’t distinguish between short term deficits to prop up the economy, and long term structural deficits that were unsustainable. As my conservative uncle liked to say, the Tea Party led Republicans were going to bring “fiscal responsibility” back to Washington. And what did they do within a month of their election? Add another $900 billion to the deficit before the new Congress even got there. Like I said previously, I understand that you need to run deficits in times of economic downturn. But I didn’t spend the last two years running a constant campaign against those deficits. Some have argued that the Republicans may be successful at extending the Bush tax cuts for the top earners in 2012. But this also sets up a fight that Obama can use to his advantage. If the Republican House brings up the extention in 2012, it should die a quiet death in the Senate. Plus, the country will be focused on deficit reduction by then, and Mitt Romney can explain to the country in the presidential debates why he wants to add another $700 billion to the debt and the onus will be on him to propose cuts to programs in order to pay for them. The deal is far from perfect. But, all in all, it’s a much better deal than I thought Obama could get just a few months ago. But don’t take my word for it. Take Charles Krauthammer’s.